With all the pizazz of an abstract painting, this big Bruneau Jasper cabochon is sure to delight the most finicky collector or artisan. So shiny, you can see the reflections of my photo booth and camera (not included with cabochon). 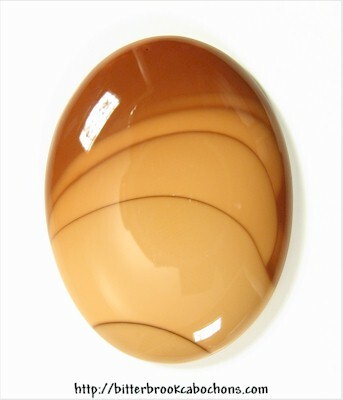 I think Bruneau deserves an oval shape so it's viewed for the pattern in the rock rather than the shape. Whatever, I still don't like to cut ovals, but the shape seems to do well for this most beautiful product of Bruneau Canyon, Idaho! 39mm x 29.5mm x 6mm. Weight: 56.95 carats.